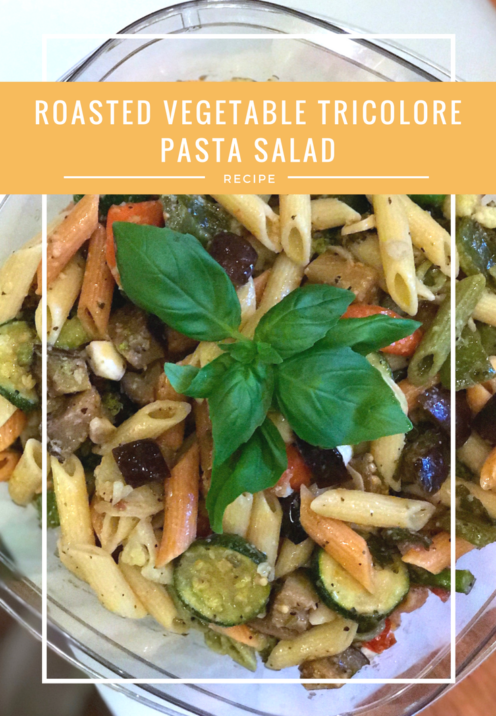 Continuing my week of yummy summer recipes, today I bring you my recipe for Roasted Vegetable Tricolore Pasta Salad. I serve this as a main dish over a bed of salad greens that have been tossed in a light vinaigrette dressing. It makes for a cool, delicious & nutritious meal, perfect for a summer picnic or light dinner. 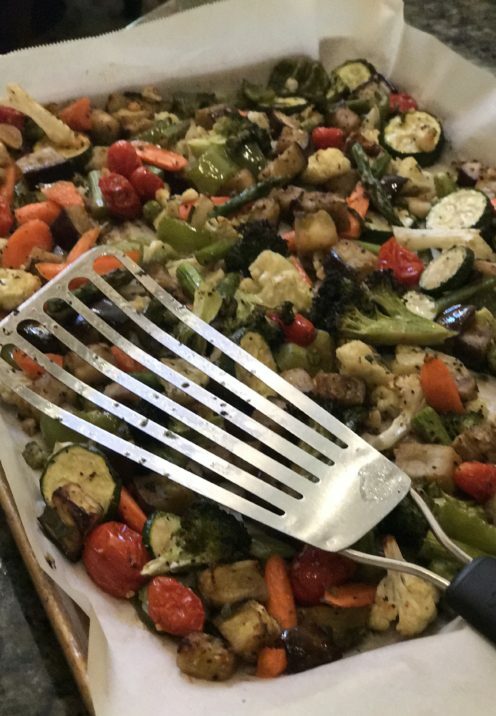 I serve it with garlic bread and a glass of white wine, and voila, I’ve got a quick and easy complete meal that everyone enjoys when trying to beat the summer heat. Line a 13″ x 18″ baking sheet with parchment paper. I use the large, Kirkland brand parchment paper for all my baking needs. It helps so much to avoid difficult cleanup jobs. 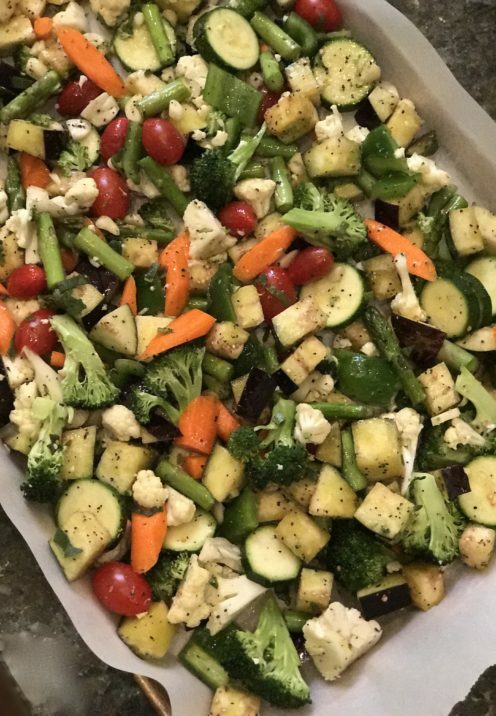 Place all of the vegetables, garlic, sage, 1/3 Cup Extra Virgin Olive Oil and a generous sprinkle of fresh, coarsely ground pepper & Kosher salt in a large mixing bowl. Gently toss until all of the vegetables are well coated in oil. Then transfer the mixture to your lined baking sheet. Spread the vegetables evenly over the bottom of the pan so they will cook evenly and begin to brown and caramelize. Place in your oven which has been preheated to 400 degrees F and roast for 30 minutes. After 30 minutes toss and turn the vegetables. I like to do this using my fish spatula, a kitchen tool I can’t live without. Honestly, my fish spatula is probably the most used tool in my kitchen. Because of its long length and flexible design, it makes flipping all kinds of things so much easier. If you don’t own one of these you really need to get one here. You’ll be very glad you did. After flipping the veggies, continue roasting them for another 15 minutes or so until they are al dente tender and beginning to brown. 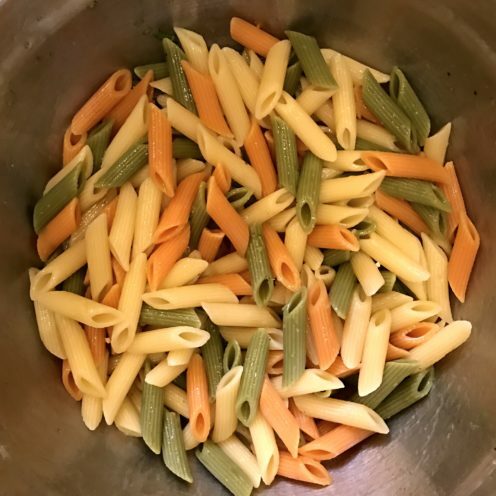 In the meantime cook your box of Tricolore Penne Pasta according to package directions until they are al dente. Drain the pasta and place it in the large bowl in which you previously had the raw veggies. Toss the pasta with 1 tablespoon of extra virgin olive oil. 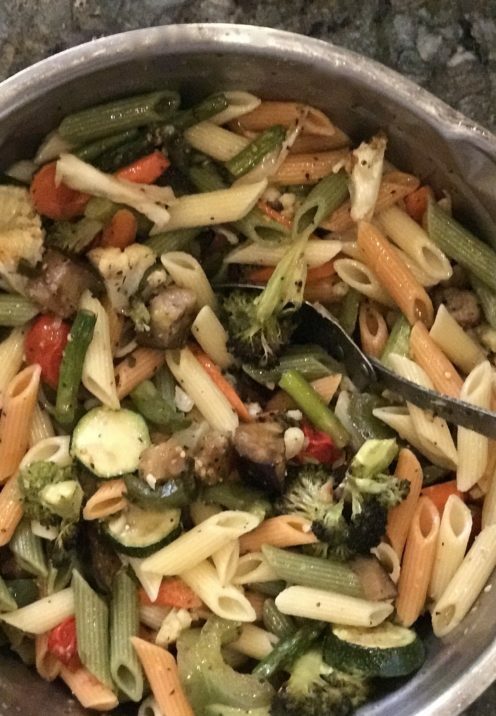 Allow the roasted veggies to cool off, then add them to the bowl of pasta. 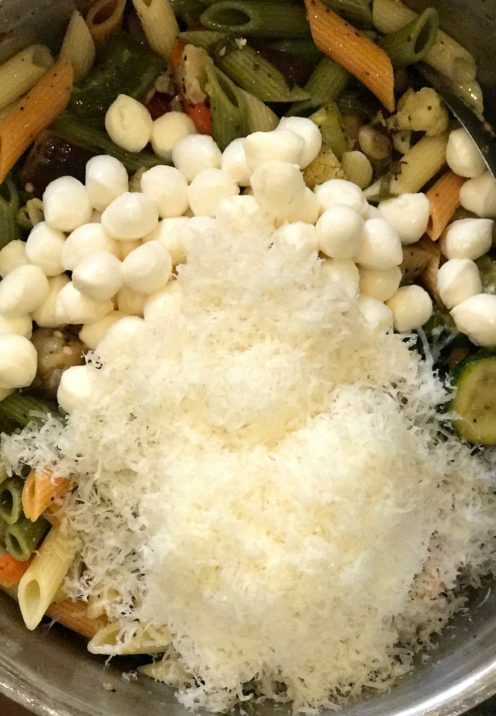 Add the mozzarella pearls to the bowl. Into a small jar with a tight fitting lid add 1/4 Cup Extra Virgin Olive Oil, 1 Tablespoon Red Wine Vinegar, 1/4 Teaspoon Coarsely Ground Black Pepper and 1/4 Teaspoon Kosher Salt. Cover the container and vigorously shake to combine. Pour 1/2 of the Vinaigrette over the vegetables & pasta and gently toss to coat. Reserve the remaining 1/2 of the vinaigrette to use on the salad green just before serving. 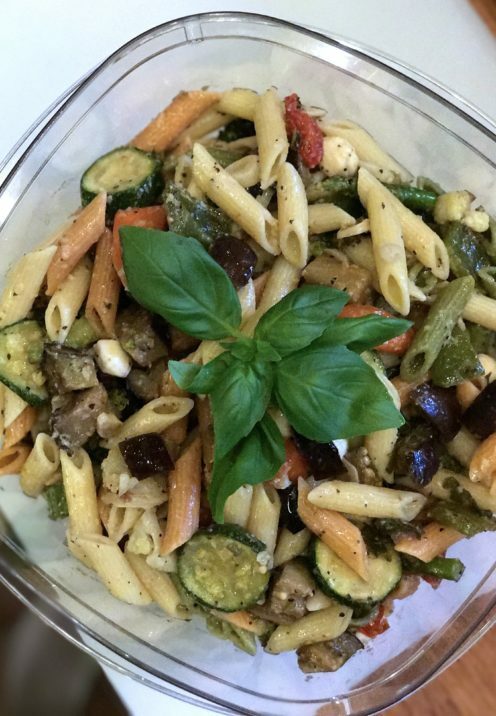 Finally, place the Roasted Vegetable Tricolore Pasta Salad in an airtight container, garnish with fresh basil and chill, covered in the refrigerator until ready to serve. Before serving toss the remaining vinaigrette over 5 ounces of Baby Spring Mix Salad Greens. Divide the dressed salad greens between 5 large plates. Top with a generous serving of Roasted Vegetable Tricolore Pasta Salad, garnish with fresh basil and serve. 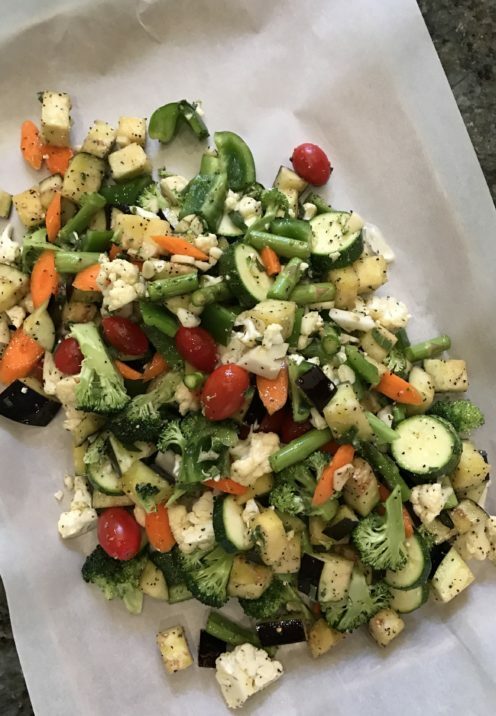 This salad makes for a cool, delicious & nutritious meal, perfect for a summer picnic or light dinner. Serve it with garlic bread and a glass of white wine, and voila, you've got a quick and easy complete meal that everyone enjoys when trying to beat the summer heat. 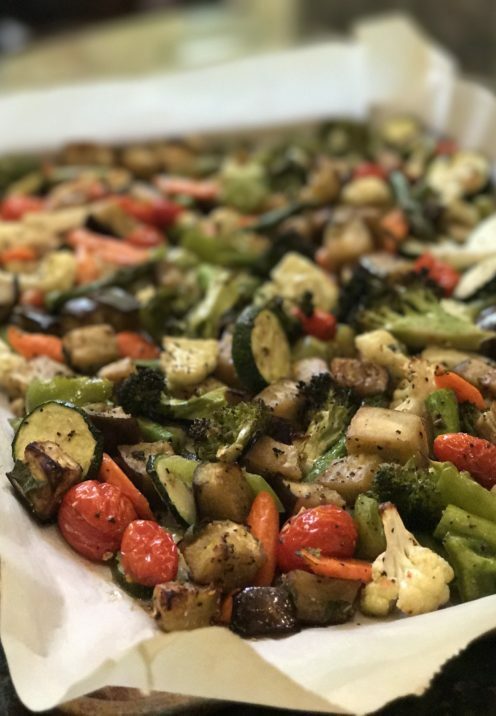 Place all of the vegetables, garlic, sage, ⅓ Cup Extra Virgin Olive Oil and a generous sprinkle of fresh, coarsely ground pepper & Kosher salt in a large mixing bowl. Gently toss until all of the vegetables are well coated in oil. Spread the vegetables evenly over the bottom of the pan so they cook evenly and begin to caramelize. Place in oven which has been preheated to 400 degrees F and roast for 30 minutes. After 30 minutes toss and turn the vegetables. Continue roasting vegetables for another 15 minutes or so until they are al dente tender and beginning to brown. In the meantime cook the Tricolore Penne Pasta according to package directions until al dente. Drain pasta and place it in the large bowl in which you had the raw veggies. Toss pasta with 1 tablespoon extra virgin olive oil. 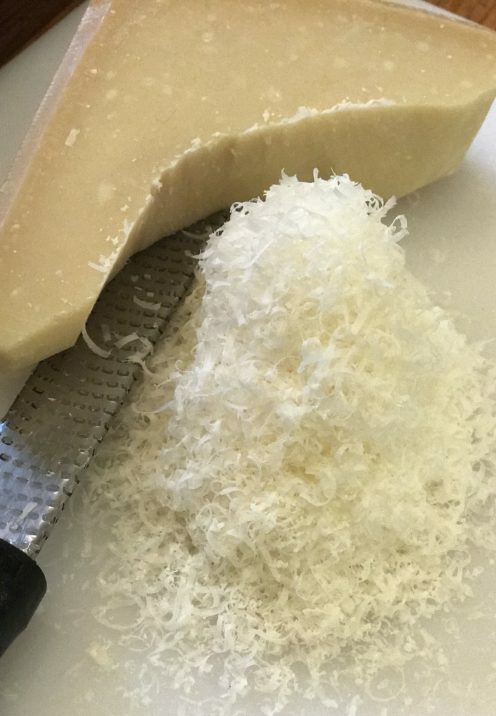 Add cooled roasted vegetables, mozzarella pearls and Parmigiano Reggiano to the bowl of pasta. Into a small jar with a tight fitting lid add ¼ Cup Extra Virgin Olive Oil, 1 Tablespoon Red Wine Vinegar, ¼ Teaspoon Coarsely Ground Black Pepper and ¼ Teaspoon Kosher Salt. Cover container and vigorously shake to combine. Pour ½ of the Vinaigrette over the vegetables & pasta and gently toss to coat. Reserve the remaining ½ of the vinaigrette to use on the salad green just before serving. 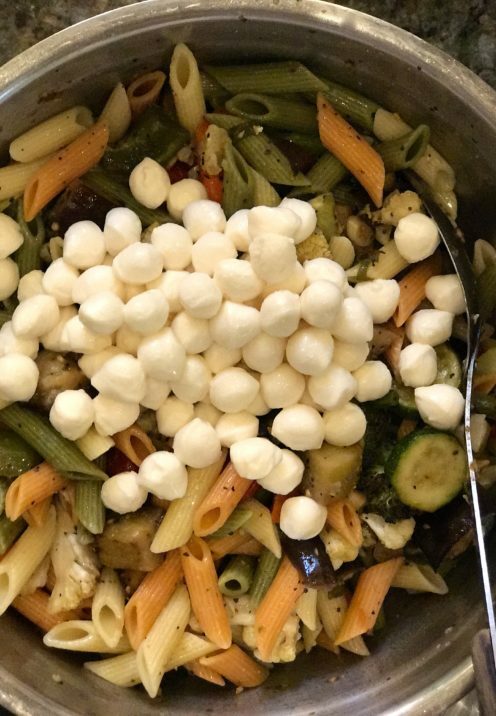 Place the Roasted Vegetable Tricolore Pasta Salad in an airtight container and chill, covered in the refrigerator until ready to serve. Before serving toss the remaining vinaigrette over 5 ounces of Baby Spring Mix Salad Greens. Divide the dressed greens between between 5 large plates. 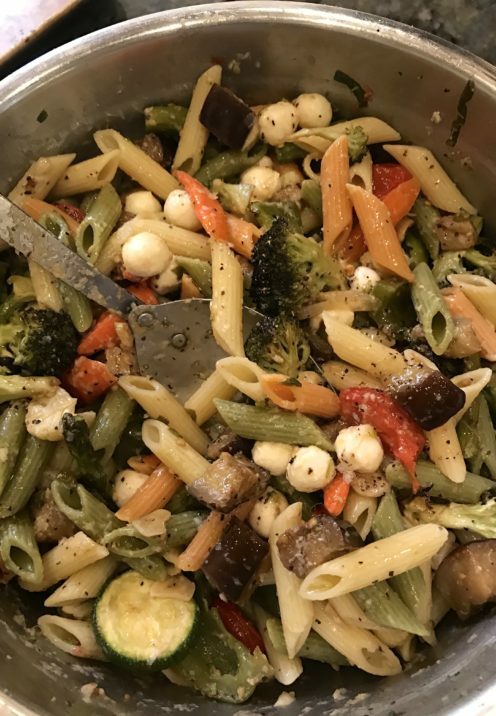 Top with a generous serving of Roasted Vegetable Tricolore Pasta Salad, garnish with fresh basil and serve.